Does the impact of economic policy depend on what we know? Do the effects of monetary policy depend on the information available to consumers and business? In this note we analyze how the way in which the central bank surprises economic actors affects the impact of its policy and the extent to which the central bank’s publication of its private information modifies the effects of its policy. In an economy that had perfect information and where the expectations of private agents were rational, monetary policy announcements would have no real effect (on activity) unless they constitute “surprises”, that is, unanticipated decisions. To the extent that private agents know the economic reasons behind monetary policy decisions, a surprise in monetary policy thus corresponds to a temporary change in the preferences of the central bankers. However, in the presence of informational friction, and especially when the information sets of the central bank and of private agents differ, the private agents do not know the central bank’s information and therefore do not know what the central bankers are responding to. When agents are surprised by a monetary policy decision, they cannot determine whether this surprise comes from a re-evaluation of the central bank’s macroeconomic information or from a change in the central bankers’ preferences. So for private agents, a monetary policy decision can reflect either their response to a preference shock or their response to macroeconomic information that has just been revealed to them. For example, an increase in the central bank’s key rate may signal to private agents that an inflationary shock will affect the economy in the future, pushing up private expectations of inflation. However, the same increase in the central bank’s key rate could be interpreted as a preference shock indicating that the central bankers want to tighten up, which would reduce private expectations of inflation. More generally, whenever the central bank and private agents have different sets of information, a monetary policy decision could convey information from the central bank about future macroeconomic developments. The way private agents interpret monetary policy surprises is therefore crucial in determining the sign and the magnitude of the impact of monetary policy. Based on this intuition, a recent work by G. Ricco and S. Miranda-Agrippino proposes a new approach to studying the effects of monetary policy shocks that takes into account the problem that agents face in understanding central bank decisions. Despite years of research, there is still considerable uncertainty about the effects of monetary policy decisions. In particular, several works have shown that, counterintuitively, an increase in output or prices follows monetary tightening –a phenomenon that is also called the price puzzle. In this work the authors show that to a large extent the results in the existing literature lack robustness due to the implicit assumption that the central bank or private agents have perfect information about the state of the economy. It turns out that it is the central bank’s transmission of information about economic conditions to private agents that could be generating the price puzzle highlighted in the literature. In the United States, it is five years afterwards that the central bank discloses the forecasts by its economists (the Greenbook forecasts) which have been used to inform its monetary policy decisions. This allows us to separate ex post the reactions of the financial markets to the new information on the state of the economy transmitted by the action of the central bank from reactions to monetary policy shocks. We use these responses to study the effects of monetary policy on the US economy in an econometric model that is flexible and robust to poor specifications. In Figure 1, we compare our approach with methods that do not take into account the transmission of information between the central bank and private agents. While these methods generate the price puzzle, with our approach we find that a monetary tightening reduces both prices and output. On the basis of these results, and in order to study whether private agents’ interpretation of monetary policy surprises depends on the information available to them, another recent working paper assesses whether the publication by the central bank of its macroeconomic forecasts could affect the way that private agents understand monetary policy surprises and thus ultimately influence the impact of the monetary policy decision. More specifically, this paper assesses whether and how the interest rate term structure of inflation expectations responds differently to Bank of England (BoE) decisions when they are accompanied or not by the publication of the BoE’s macroeconomic forecasts (of inflation and growth) and when these are corroborated or contradicted by its forecasts. It can be seen that, on average, private inflation expectations respond negatively to restrictive monetary shocks, as expected given the mechanisms for transmitting monetary policy. The main result of Figure 2, however, is that the central bank’s inflation forecasts change the impact of monetary shocks. 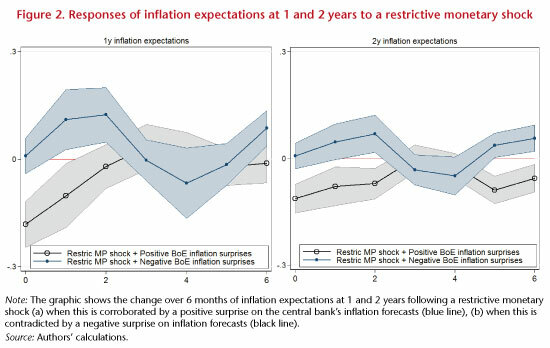 Monetary shocks (in the example here, restrictive) have a greater negative impact when they interact with a positive surprise on the central bank’s inflation forecasts. On the other hand, a restrictive monetary shock that interacts with a negative surprise on inflation projections has no effect on private inflation expectations. 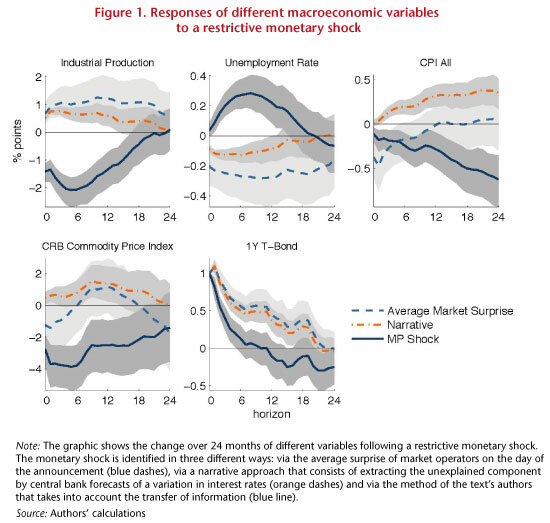 This observation suggests that, when monetary shocks and forecast surprises corroborate one another, monetary shocks have a greater impact on private inflation expectations, possibly because private agents can deduce the preference shock of the central bankers and respond more strongly. On the other hand, when monetary shocks and forecast surprises contradict each other, monetary shocks have no (or less) impact, possibly because private agents receive opposing signals and are unable to determine the direction of monetary policy. They are thus also responding to the macroeconomic information disclosed. These results show that the publication by central banks of their macroeconomic information helps private agents to process the signals that they receive and thus modifies their response to monetary policy decisions. This study thus suggests that providing guidance on future changes in inflation rather than on future interest rate developments (Forward Guidance policy) can make monetary policy more effective by enabling private agents to better distinguish the central bank’s macroeconomic information from its preferences. See Baeriswyl, Romain and Camille Cornand (2010), “The signalling role of policy actions”, Journal of Monetary Economics, 57(6), 682-695; Tang, Jenny (2015), “Uncertainty and the signalling channel of monetary policy”, FRB Boston Working Paper, no. 15-8; and Melosi, Leonardo (2017), “Signalling effects of monetary policy”, Review of Economic Studies, 84(2), 853-884. This study focuses on the United Kingdom because the BoE’s forecasts have a specific characteristic that makes it possible to econometrically identify their own effects. Indeed, the question asked demands that the central bank’s forecasts do not depend on the current policy decision, so that monetary surprises and forecast surprises can be identified separately. The BoE’s projections are conditional on market interest rates and not on the key rate, meaning that the BoE’s forecasts are independent of monetary policy decisions.